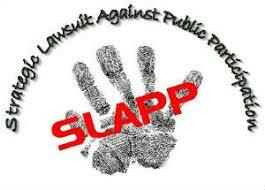 Anti-SLAPP laws (Strategic Lawsuit Against Public Participation) shield citizens from bogus lawsuits clearly intended to silence criticism. This lack of protection has resulted in a number of merit-less lawsuits being filed. One of the most ridiculous -- a former university program head suing his replacement for things a journalist said -- managed to make its way all the way up to the state's appeal court. In the end, the defendant was awarded $10,000 in legal fees, but none of that was guaranteed when the plaintiff started wasting everyone's time and money. As the law stands now in Tennessee, only communications to public officials about public entities are shielded from defamation lawsuits. It doesn't cover things like negative reviews of businesses, criticism of any public figure, or -- like the case above -- things defendants never actually said. The new law would actually function like an anti-SLAPP law should. It would halt discovery until a ruling on the anti-SLAPP motion and allow the prevailing party to recover fees. Under this bill, if a legal action is filed in response to a party's exercise of the right of free speech, right to petition, or right of association, that party may petition the court to dismiss the legal action. All discovery in the legal action will be stayed upon the filing of a petition pursuant to this bill and the stay of discovery will remain in effect until the entry of an order ruling on the petition. The court may allow specified and limited discovery relevant to the petition upon a showing of good cause. The petitioning party will have the burden of making a prima facie case that a legal action against the petitioning party is based on, relates to, or is in response to that party's exercise of the right to free speech, right to petition, or right of association. If the petitioning party meets this burden, the court will dismiss the legal action unless the responding party establishes a prima facie case for each essential element of the claim in the legal action.